Particulate matter is the term used for a mixture of solid particles and liquid droplets found in the air. PM pollution is made up of soot (from diesel and coal burning), dust, and vehicle emissions. 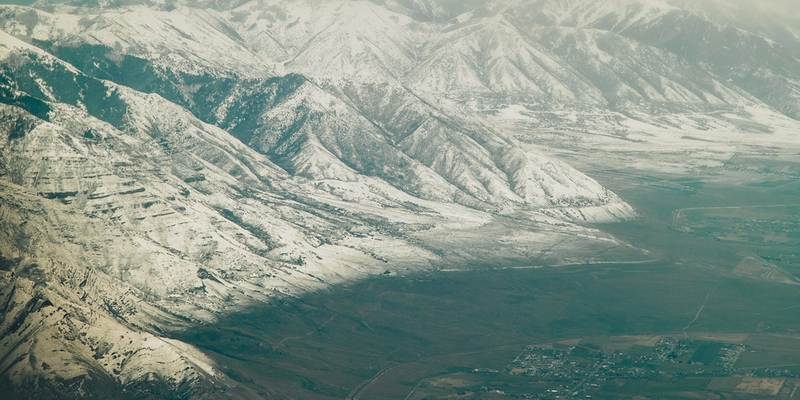 In Utah it is usually a winter time problem (or from wildfires at other times of year), especially during inversions. It is the smallest particles that are of the most concern. Specifically those measured as 10 micrometers or less in diameter (or approximately 1/10 the diameter of a human hair) and 2.5 micrometers or less in diameter (approximately 1/30 the size of a human hair). Both sizes of PM can cause health problems. PM2.5 is of significantly more concern, however, because of its small size it can be inhaled deeply into the lungs and be trapped and cause damage. PM10 is often simply "dust" and can typically be filtered by nose hair and lung cilia and then coughed out. Inversions occur when cold temperatures with little or no breeze cause a dense layer of cold air to become trapped under a layer of warmer air. The warmer air acts like a lid trapping pollutants near the valley floor. The longer the inversion lasts, the more pollutants become trapped. Along the Wasatch Front, inversions will stay until wind or a storm front comes through. This can run from a few days to a week. The longer the inversion lasts, the more pollution there is in the air. The sources of PM2.5 include fuel combustion from automobiles, power plants, wood burning, industrial processes, and dieselpowered vehicles such as buses and trucks. These fine particles are also formed in the atmosphere when gases such as sulfur dioxide, nitrogen oxides, and volatile organic compounds (all of which are also products of fuel combustion) are transformed in the air by chemical reactions. According to the Utah Department of Environmental Quality, approximately 60 percent of PMs come from vehicle emissions, with 40 percent coming from industrial and other sources. How does PM2.5 affect human health? PM2.5 poses the greatest health concern because it passes through the nose and throat, deep into the lungs, and across the lungs into the cardiovascular system. PM2.5 can aggravate heart diseases such as congestive heart failure and coronary artery disease. If you have heart disease, particles may cause you to experience chest pain, palpitations, shortness of breath and fatigue. PM2.5 has also been associated with cardiac arrhythmias and heart attacks. Particles can aggravate lung diseases such as asthma and bronchitis, causing increased medication use and doctor visits. If you have lung disease, and you are exposed to PM2.5, you may not be able to breathe as deeply or vigorously as normal. You may have respiratory symptoms including coughing, phlegm, chest discomfort, wheezing and shortness of breath. You may experience these symptoms even if you’re healthy. PM2.5 can also increase your susceptibility to respiratory infections. Children are more susceptible to the health risks of PM2.5 because their immune and respiratory systems are still developing. Children breathe up to 50 percent more air per pound of body weight than do adults. The breathing of fine particles by children is believed to cause both acute and chronic respiratory problems such as asthma. PM2.5 pollution causes stunted lung development in children and decreased lung function into adulthood. What can I do to reduce my exposure to PM2.5? PM2.5 pollution is associated with leukemia, lymphoma, and central nervous system tumors, especially in children. PM2.5 pollution causes pre-maturity and low birth weight in infants. The Utah Dept of Environmental Quality provides hourly PM2.5 monitoring for the Salt Lake Valley. Know and use PM2.5 levels to reduce your family’s exposure to the air pollution and your personal air pollution production. PM2.5 level = 10 Sweet! Give thanks for a favorable weather pattern and enjoy the clean air outside. PM2.5 level = 20 Whoa! Think twice before heavy exercise or taking children outside to play. Perhaps the air will be cleaner at a different time of the day. Start thinking about ways to reduce you personal contribution to our air pollution problem. Curb fuel consumption. PM2.5 level = 35 Yikes! Particulate pollution in the air is hazardous to the health of you and your family, for some even deadly. Do everything reasonable to reduce your fuel consumption and protect yourself and your children from the outside air. How can I reduce personal contribution to PM2.5 air pollution? Nearly 100% of PM2.5 in Utah comes from consuming one of three fuels: gasoline, diesel, and coal. When an inversion is forecast or the PM2.5 level is raising and no storm is on the horizon, reduce your fuel consumption. Gasoline and Diesel – At least half of the air pollution along the Wasatch Front comes from the gasoline and diesel we burn in our cars and trucks. That means you can make a difference every time you get in a vehicle. 2. Trip Chain. Combine all your errands into one big round trip. It saves you time and reduces air pollution. 3. Accelerate from a stop more slowly and drive the speed limit or less. The faster you drive, the more fuel you consume, and the more pollution you produce. 4. Telecommute from home. Use the telephone or Internet to accomplish your work or errands−one less car on the road. 5. Easiest of all, do not leave your car to idle. If you’re going to be more than 10 seconds, turn it off. Turning a stopped car off should be a habit, just like wearing a seat belt. Idling wastes gas and money and directly exposes you and your family to unnecessary pollution. Coal – Nearly all of Utah’s electricity comes from one fuel – coal. If you aren’t using a light or an appliance, turn it off. It’s really that easy. Ozone is the primary cause of summer air pollution and is sometimes referred to as "smog". Ozone pollution or smog is formed when volatile organic compounds (VOCs) and nitrogen oxides (NOx) mix with sunlight and heat. Ozone is mostly a summer time problem, when days are long and hot. Ozone is a mix of chemicals th emitted mainly from vehicle tailpipes, diesel engines, and the smokestacks of coal-fired power plants. Numerous scientific studies have linked ground-level ozone exposure to a variety of problems, including: airway irritation, coughing, and pain when taking a deep breath; wheezing and breathing difficulties during exercise or outdoor activities; inflammation, which is much like a sunburn on the skin; aggravation of asthma and increased susceptibility to respiratory illnesses like pneumonia and bronchitis; and permanent lung damage with repeated exposures. Those especially susceptible are people with lung disease, children, older adults, and people who are active during ozone pollution season. How can I reduce my exposure to unhealthy smog? Ozone pollution follows a daily cyclical pattern, largely related to commuter traffic. To reduce exposure, people should reduce physical activity outside during the most polluted hours of the day (12:00 to 6:00 p.m.). The best time for outdoor summer physical activity is before noon or after 6:00 pm. If you must exercise between noon and 6 p.m., reduce your activity level and consider exercising indoors..
What can I do to reduce my contribution to the smog problem? In urban and suburban areas, the best choice you can make during the summer months is to leave your vehicle parked for the day and look for other ways to travel. Learn more about ozone from the EPA.